How can cattle – or sheep or goats for that matter – add to the amount of carbon in the atmosphere when they get all their carbon from the atmosphere in the first place? In fact, the presence of carbon in the atmosphere – in the form of carbon dioxide – is so important that the cow could have never been born if it was not present. The carbon had to be there before the calf was born otherwise the cow’s mother could not have survived. Without carbon dioxide in the air she breathed, she could not have even produced milk for her offspring. It may be necessary for some readers to re-think, as I have done, our understanding of the role livestock play in the atmospheric carbon cycle. Far from being a fundamental net contributor to global warming gases, as is widely perceived in the current conventional wisdom, livestock play a neutral role with regard to the cycling of atmospheric carbon. This may be a new and challenging proposition to many but it is entirely scientifically sound. The first step is to deal with the misconception that cattle are just standing there in the middle of the paddock belching vast quantities of completely new carbon in the form of carbon dioxide and methane. This view fails to recognize that livestock cannot ‘make’ any carbon atoms but they get it all from plants which, in turn, get it from the atmosphere by photosynthesis. When the cattle breathe out these gases, all of the carbon they contain returns to the atmosphere again, the place from which it came in the first place. This includes the carbon in the exhaled carbon dioxide and the carbon in the belched methane. 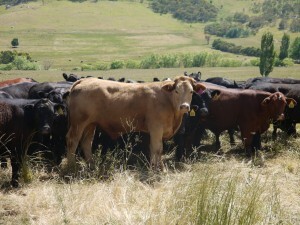 With grazing animals, the carbon comes from the atmosphere and goes back to the atmosphere. No extra carbon is created. The situation with a cow can be distinguished from that of a power station or car. These burn fossil fuel that comes from a different source than that accessed by the sheep or cattle. As discussed, the cow or sheep gets its carbon from the air, a power station gets it from the ground. After burning the carbon, the power station releases new carbon dioxide to the air. This is new carbon which was not there before the combustion process took place. A further difference between grazing animals and power stations is that the animals can re-use its carbon dioxide waste product by eating more grass. The next mouthful of grass the animal eats represents a new draw-down of carbon dioxide – in the form of carbohydrate chains in the food – from the atmosphere. A power station can never re-use its carbon dioxide waste product. It has to use new coal, new oil or new gas every time.